Spring is in full effect here in Florida. Driving through the back country roads near my parents home, familiar smells of childhood are carried by the breeze. The honey aroma of orange blossoms, jasmine, and honey suckle can turn an ordinary drive with the windows down into an intoxicating affair. The trees are getting in on the action too. Bursting with new bright green growth, mirroring the grasses and setting the backdrop for pops of yellow, pink and purple wildflowers. One of my favorite flowers to see growing on the roadside is a common herb we call here in the South, Spanish Needle. An incredibly humble herb who grows so prolifically its often overlooked and (gasp!) even called a weed. Floridians know this plant well, even if they aren’t attuned to its healing properties. Spanish needle (Bidens pilosa/ B. alba) is the #3 nectar producing species in the state coming behind saw palmetto and orange blossom. Some would say its a pioneer species, often being the first herb that pops up after the soil has been disturbed. 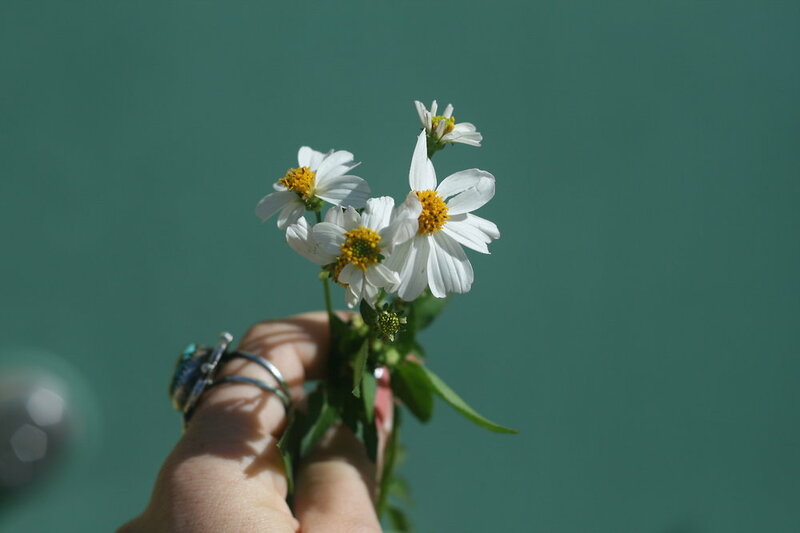 Its a plant that’s hard to miss, since most of the year, little white daisy-like flowers are scattered along the roadsides, tucked in cracks of the sidewalk or popping up in abandoned urban lots. The latin name Bidens means “two teeth,” describing its seed that resembles a two pronged fork that sticks to just about everything. But plants are smarter than we give them credit for. Having a toothed seed allows for easy spreading by animals of all kinds, especially humans. My love affair with Bidens began when I learned of its medicinal properties and when I was shown what good “daisy chains” they make. Traditionally, its been used as medicine throughout China, Africa and Central America. People have used this plant to expel pathogens from the surface of the body, clear up heat, remove toxins, and eliminate stagnancy, just to name a few uses. On the more intense side of its healing properties, studies are finding that the chemical constituent polyacetylenes have shown to inhibit the malaria parasite Plasmodium faliciparum, which makes sense why its been used in the Amazon where malaria is a real cause for concern. Personally, I feel really called to work with Spanish Needle medicine because of its affinity for the urinary mucosa and its ability to tone and strengthen the tissue. The revered South West herbalist, Michael Moore first turned me on to how powerful this plant truly is. Perhaps Bidens does not just work on the physical needs of the urinary system, but also the emotional needs that imbalance in an area, often sheds light upon. The urinary system is part of the Sacral Chakra, which governs our sense of safety and well being. So, if we are having feelings of not being nurtured, either by ourselves or others, or not feeling safe, Bidens is a plant that can help on these levels by filtering out emotional toxins that are no longer serving our being. In his book, Medicinal Plants of the Pacific West, Moore says that Bidens also helps to remove environmental pollution which goes in line with the traditional uses of removing toxins and eliminating stagnancy. Living in the city, I often wonder, if Bidens are growing in such abundance for more of a reason that just loving disturbed sandy soil, but perhaps, its the medicine of the city, growing everywhere to help us with the constant bombarding of pollution in urban areas. Most times, when we are in tune and paying attention, its easy to notice that what we need the most is right in front of us. Especially in the case of using Bidens this spring. Its like the Earth is exploding with its flowers, so that everywhere we look, this medicine is right there, ready to heal and ready to teach us if we are willing to listen.